Today I want to talk to you about the New Media for REALTORs series I wrote last month, specifically What was the Point? I’ve been telling you FOREVER that online marketing is all about the words you use, but if you’re like me you think talk is cheap. So rather than tell you again How Important Keywords are, I thought I’d reveal exactly what I did and why I did it. 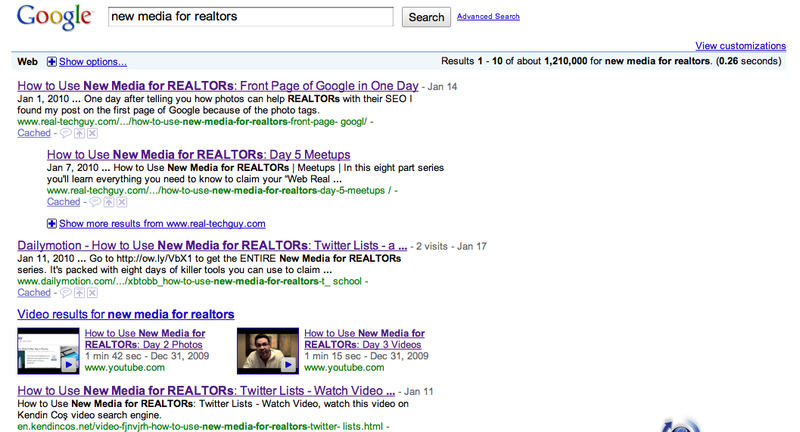 Why New Media for REALTORs? When I started chasing after this long tail keyword I hadn’t even used it in this site at all, so this was ALL new to me. First I did some keyword research on the term “New Media for REALTORs” and found there wasn’t enough search volume for Google to have any data on it. Then I went to google and typed in the phrase and found there were about 1,200,000 sites that came up with that term with only the first ten results being really relevant. As you can see, by using a combination of videos, photos, and blog posts we’ve taken over the front page of Google for the keyword phrase. I know it may seem like I’m tooting my own horn here, but the fact is that you can use these very same tactics to target keyword phrases in your market. All you need to own is a couple of good phrases to get more traffic to your site and increase your reach into the community. I’m hoping that sharing this data has inspired you to try it for yourself. All you have to do is a little keyword research for long tail terms in your area. Once you find something that works you can write a series of blog posts which feature your long tail terms and if you’re feeling really frisky you can even create some videos to go along with it. Sorry to burst your bubble but if you type in the keywords to anyones company regardless of what they do it will come up 1st in google… no seceret there I ve been doing real estate web marketing for over 15 years and am President/CEO of one of the largest real estate sites out there and anyone will come up first with there name!! Hey Jimname, thanks for the insight. I can tell you're well versed in the “Real Estate Web Marketing space,” but there are a few things that I'd like to point out. First, and most obviously, we didn't come up for “Our Name.” We came up for a search term. A minor oversight on your part I'm sure. Secondly, this post is written for the MAJORITY of people who read my blog. If you're better than them, or me then you don't have to read it. And Lastly, you're not bursting my bubble, you're just proving my point. ProBlogger is one of may favorites. Let me know how that search works out for you and thanks for reading. It is definitely good practice to add keywords to your photos. 60% of my blog traffic come from my photo images. It sure makes you re-think about keeping your generic photo names. I'm sure it also helps us with the change to real time search as well.